No one wants to drive around with a beat-up looking car, but dents and dings are sometimes hard to avoid. Whether you backed up into a trashcan or got into a little fender bender that resulted in a few dents or scratches, it’s best to repair these problems in a timely manner. These minor issues might be easy to ignore for a while, but letting them fester can result in larger problems, ultimately resulting in a reduction in your car’s resale value. The good news is, paint loss, dents, and even rust can be repaired by an autobody shop like Breezy Point Autobody; assuming Stratford, Connecticut is within a reasonable distance from you. Peeling and chipping paint can cause more problems than just making your car look old and worn. It can cause structural damage when it becomes rust and corrosion. The rust can become deep enough to corrode the metal beneath it, causing more trouble for your vehicle. Most buyers will be well aware of the serious issues that rust can cause. A corroded car can be difficult if not impossible to repair. It’s important to catch and repair these issues at early so they don’t get worse. A knowledgeable buyer will be wary of buying your vehicle because of these issues. Luckily, the talented autobody repair professionals at Breezy Point Autobody in Stratford, Connecticut can repair many of these problems. If your car has scratches or missing paint, a professional paint repair experts at Breezy Point Autobody will be able to perfectly match the color of your car to fill in the missing paint. The shop should be able to mix the paint on site and get an exact match. There’s no need to repaint the entire car, they’ll just fill in the damaged area. The same goes for dings and dents. Usually, these minor issues shouldn’t cause you much distress as they only affect the outside layer of the car. But if you’re planning to sell your car, the aesthetic value of the repair might be worth it. 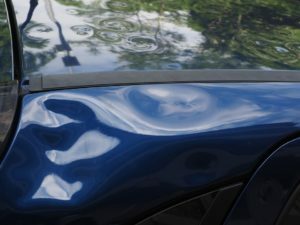 Just like with paint loss, any dents or dings will be taken into consideration by people looking to purchase your vehicle. Even if the buyer decides to purchase the vehicle, these issues can be reasons to negotiate a lower price. Luckily, with professional dent removal, a trained autobody technician will be able to work out any dents and get your car looking like new again. Keeping your vehicle in pristine condition is the best way to preserve its resale value. Your car’s appearance is the first thing a buyer sees. Any paint loss or rust is considered an eyesore and can make a buyer disinterested in your vehicle. With professional autobody repairs, the end result should be unnoticeable, letting buyers see the true beauty of your vehicle! For more auto advice, visit our website, or contact us with any questions via our convenient Contact form or call us at (203) 378 4909.